I converted from day hiking and car camping to backpacking in Spring 2013. I borrowed various supplies for my first backpacking trip and that experience sparked my interest in testing backpacking gear. I always hike with a group and I like the gear talk when in camp. 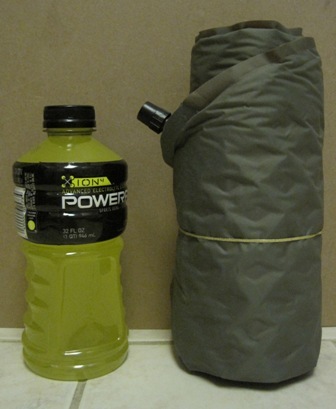 I am a tent camper looking for ways to lighten my pack. My backpacking trips are currently weekend excursions in Southern California, USA. If my business travel allows me to get away, I try to backpack one or two weekends a month. 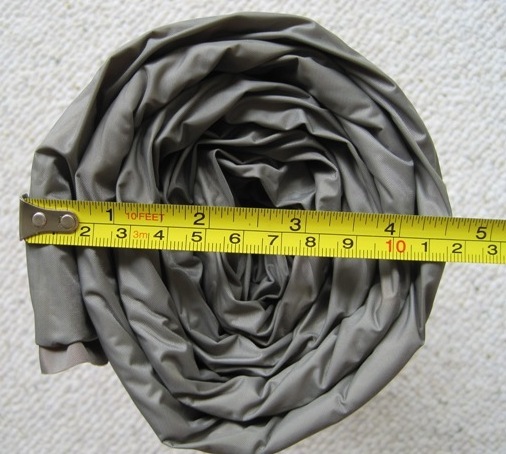 The WR = Women's Regular size has listed dimensions of 20 in (51 cm) width x 66 in (168 cm) length. 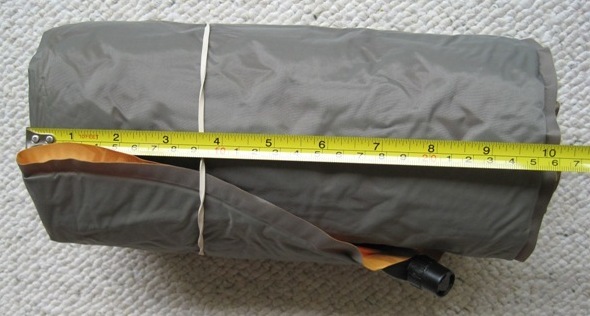 Measured Dimensions: 20 in (51 cm) width near the top x 66 in (168 cm) length, including seamed edges. Other ProLite sizes available are XS = Extra Small, S = Small, R = Regular and L = Long. The Therm-a-Rest ProLite WR is a lightweight, self-inflating 3-season mattress. The WR = Women's Regular version is specifically designed for women, offering more insulation in the torso and foot area for increased warmth and comfort. The mattress is filled with star-punched urethane foam. I notice a closely spaced star pattern in the head and leg area, and more of an upward pointing chevron pattern in the torso and foot area. Mattress sleeping side is poly fabric in bright orange color with a leaf pattern, while the bottom side is dark grey nylon. All around, the two mattress fabrics are welded together, creating a narrow edge of 0.25 in (0.6 cm). The flat, non-structured mattress has a tapered shape, widest for the upper body and reducing towards the feet. The mattress surface feels velvety (neither glossy nor rough); neither the surface nor the bottom has anti-slip dots or anything of that kind. On its upper left, the mattress has the THERM-A-REST logo imprinted with its PROLITE WOMENS type designation in small font underneath plus manufacturer contact info. In that same upper left area, the black plastic valve sticks out from the mattress weld. I open the valve counterclockwise for its self-inflation and close it clockwise after I have added a few additional breaths of air. Cascade Designs recommends to store the mattress unrolled, filled with air and in a dry place, with the valve open. Cascade Designs' Limited Lifetime Warranty guarantees the mattress without time limit against defects in materials and workmanship. Should a returned mattress qualify under this warranty, Cascade Designs will repair or replace it at their option. The customer's only charges are shipping the mattress to the authorized return center and the manufacturer pays for the return to the customer. As I had no experience with the self-inflating mattress process, for its very first use I allowed the mattress to self-inflate at home for a couple of hours with its black plastic valve open, then added several long breaths to inflate it more, closed the valve and stored it overnight. The inflated mattress feels very light and is easy to lift and handle. The next day, I deflated it by opening the valve, then folded the mattress in half (= the size of the stuff sack length) and rolled it up while repeatedly kneeling on it to squeeze the air out. I closed the valve, unrolled the mattress and rerolled it again with its valve closed, then opened the valve towards the end and squeezed all remaining air out. Finally I closed the valve and the mattress stayed perfectly rolled up at its trail size (the space it uses in my backpack) of 4.5 inch x 10 inch (11 cm x 25 cm). Using this process, I have been able to roll up the mattress to perfection every time, whether at home or in the field. 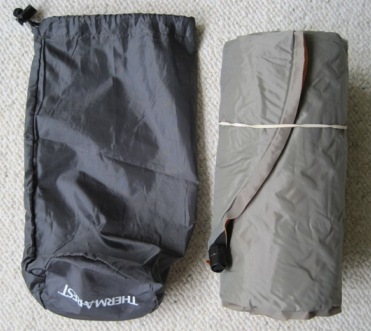 Rolled up this way, the mattress fits great into its stuff sack but I keep it coiled inside my backpack with a simple rubber band. I usually take its handy fabric stuff sack (0.6 oz = 17 gram) that was part of the sales kit for other items inside my backpack. Most of my backpacking trips have been to warm, sunny Southern California locations (except one trip with a low of 35 F (2 C) nighttime temperature). After setting up my tent, I toss the mattress onto the tent floor with the black plastic valve opened and the mattress always easily self-inflates. I always add several breaths of air to really well-inflate the mattress for its ultimate firmness, then close the black plastic valve by rotating it clockwise. Finally I place my sleeping bag on top. Both the mattress and my sleeping bag are mummy-shaped and therefore fit well. I like to sleep on my side and throughout my trips so far, with a variety of soil conditions, the mattress has provided good hip and shoulder support, so I have not felt the ground. 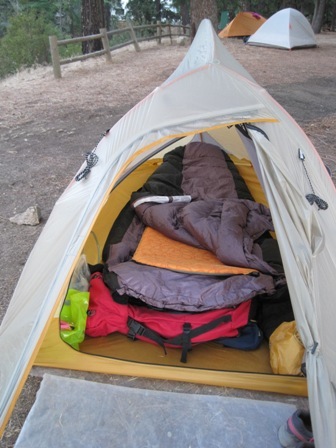 I switch sleeping sides a lot at night and have noticed how very quiet the Therm-a-Rest is: I frequently hear the mattresses creak from fellow backpackers' tossing and turning, while I hear not a sound from my mattress. 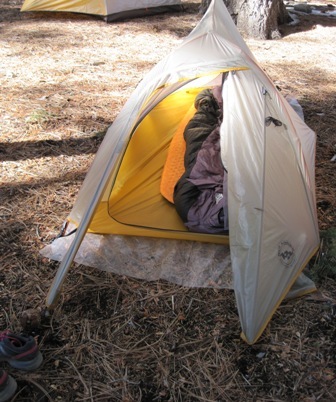 Once I did not pick a great spot for my tent and when going to bed noticed that I was sleeping a bit feet-downwards. I placed my backpack at my feet as "support". That night, I tossed and turned a lot but noticed that my sleeping bag stayed on the mattress. My pack as foot support helped, despite me pitching tent at a slight slope. The real challenge was an unusually cold Southern California October night that reached a low of 35 F (2 C). Most of the campground was covered in snow, while I pitched my tent in an area with no snow but still near-freezing ground temperature. The self-inflation worked very well even with a cold daytime temperature of 58 F (14 C). At night a cold wind blew. I woke up a lot throughout the night, often having cold feet and blaming it on my sleeping bag plus the large mesh door of my tent. I felt that the mattress provided borderline enough protection against body heat loss to the ground. The manufacturer gives this 3-season mattress an R-2.8 rating. The R stands for insulation resistance: how well the mattress insulation resists the flow of heat. A winter-suited 4-season mattress pad may have an R-5 rating or considerably higher. As I do not have experience with such a higher R-rating mattress, I can only say I felt the mattress protected my body from the cold ground temperature. During my most recent trip, I placed the mattress inside my sleeping bag. I have a pretty big sleeping bag, so the mattress had enough room inside and I thereby slept directly on the mattress. I slept well, tossed and turned much less than usual. Maybe because the mattress is firmly held in place below me by my sleeping bag (almost hugging my body), I do not subconsciously reposition that much during the night. I felt warm and comfortable on the mattress and will try this again. This report was created with the BackpackGearTest.org Report Writer Version 1. Copyright 2013. All rights reserved.